Italian food is a favourite of ours and we’re sure it’s one of yours too. The pizza, the pasta, the bread, the desserts, we would be quite happy eating come un Italiano every night of the week. Seeing as this week is Italian week at Betty (we’re celebrating the launch of The Glamour of Italian Fashionexhibition at the V&A) we are going to be doing just that! Our food editor Alana has put together a tasty Italian themed menu that is sure to wow friends at your next dinner party. 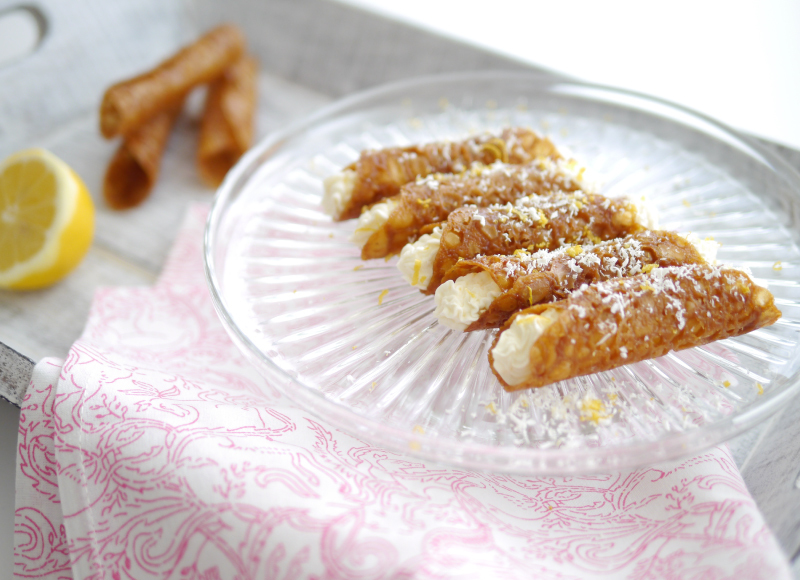 These recipes are simple and fresh and the end result looks pretty lovely on a plate too. 1. To make the pasta: Tip the flour onto a clean work surface and make a well in the middle. Crack the eggs into the well and gradually mix the flour and eggs together with a fork. Bring it together with your hands to form a ball. (If you have a food processor, just whizz it all together to breadcrumb consistency, tip on to a clean surface and work into a ball). Knead the ball of dough to develop the gluten in the dough, for about 10 minutes, or until it is silky and smooth. Cover in cling film and let rest in the fridge for 30minutes. 2. To make the filling: Blend the peas together with the ricotta, mint and salt until you have an almost smooth paste. Add the pine nuts and pulse until a little broken up and combined. If you don’t have a food processor, mash the peas using a fork and mix with the other ingredients. Set aside. 3. Remove from the fridge and cut about one sixth of the dough away. Cover the rest and return to the fridge – unless you have a huge work surface, you will need to work in small batches as you are rolling it by hand. 4. Lightly dust the surface with some ‘00’ flour and roll the dough into a long rectangular shape. It needs to be paper thin, so requires a little elbow grease. Using a 6cm cookie cutter, lightly mark circles along one of the long sides of the pasta dough, leaving a little gap in between each circle and the edges. You will be folding the dough over once you have spooned in your filling, so make sure there is enough dough on the other side to cover each circle. Spoon 1tsp of filling into the centre of each circle, fold the other half of the dough over, and press firmly around the filling to stick the two sides together. 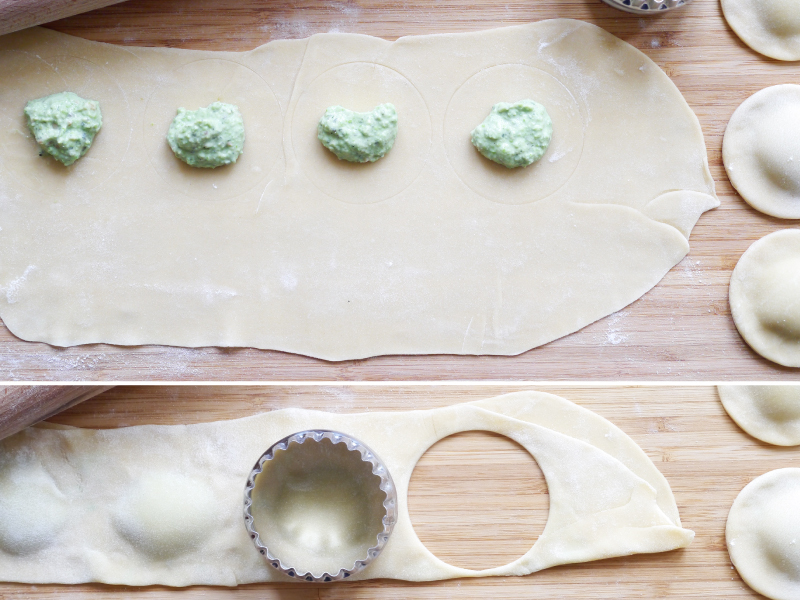 Use the cookie cutter to cut out each ravioli, place onto a board and cover with a damp tea towel. Repeat until all the dough has been used. 5. Once all the ravioli has been cut, bring a pan of water to the boil with a little salt and olive oil. Cook the ravioli for 4mins, remove with a slotted spoon and place onto a sheet of kitchen paper to soak up any excess water. 6. To serve: Place in a pasta bowl, drizzle with some extra virgin olive oil, sprinkle liberally with grated parmesan or pecorino, some cracked black pepper and finish with toasted pine nuts and mint leaves. 1. Preheat your oven to 160C fan/180C. 2. To make the snaps: Melt the butter, sugar and golden syrup together in a saucepan over a medium heat. Sift the flour and ground ginger into a mixing bowl and add the lemon zest. Make a well in the middle and slowly pour in the melted butter and sugar, followed by the le on juice, stirring as you go, until it is well combined. 3. Line a baking tray with silicone/wax coated parchment paper. Spoon 5 x ½ tsp of mixture onto the baking tray, making sure each dollop is spaced well from the other, as they will spread in the oven. Bake in the oven for 8-10 minutes until set, golden brown and lacy in appearance. Remove from the oven and allow to cool for a minute or so – they need to be firm-ish and pliable – before peeling off the tray with a palette knife and wrapping around the handle of a wooden spoon (either wrap the handle in tin foil, or grease with oil, to stop the snaps from sticking). Allow to firm up, before removing from the handle and cooling completely on a wire rack. It’s useful if you have more than one wooden spoon, as you will need to do this part of the process at the same time to avoid them setting before you can wrap them. 4. To make the lemon cheesecake filling: Beat all the ingredients together in a mixing bowl until well combined. Fill a piping bag and pipe the mixture into the cannoli in two halves; from middle to end, turn and pipe from middle to the other end. If you don’t have a piping bag, make one using greaseproof paper. Fold a square of paper in half diagonally to create a triangle. Cut along the fold and repeat, until you are left with ¼ of the original paper size. Roll the corners of the longest side in, to meet one another, creating a cone. Fold the excess paper/ point inwards to secure the fold. Fill two thirds of the cone with the cheesecake filling, and squeeze together at the top to push the filling towards the end. Snip the end of the cone off, and you are ready to pipe!